Many people don't know that Buddha did teach circumcision - a bloodless circumcision! Body, Speech and mind are circumcised to reveal the 3 Vedic sacrificial fires to reveal the true heart that can sacrifice. No painful cries of children! No more pain! That's Buddha! Taṃ kiṃ maññatha bhikkhave rūpaṃ niccaṃ vā aniccaṃ vāti." What do you think, monks — Is the body constant or inconstant?" "Yam-panāniccaṃ dukkhaṃ vā taṃ sukhaṃ vāti." Etaṃ mama eso'ham-asmi eso me attāti." "Taṃ kiṃ maññatha bhikkhave vedanā niccā vā aniccā vāti." "What do you think, monks — Is feeling constant or inconstant?" "Taṃ kiṃ maññatha bhikkhave saññā niccā vā aniccā vāti." "What do you think, monks — Is perception constant or inconstant?" "Taṃ kiṃ maññatha bhikkhave saṅkhārā niccā vā aniccā vāti." "What do you think, monks — Are mental processes constant or inconstant?" "Taṃ kiṃ maññatha bhikkhave viññāṇaṃ niccaṃ vā aniccaṃ vāti." The Blessed One was staying in Rajagrha at Vulture Peak along with a great community of monks and great community of bodhisattvas, and at that time, the Blessed One fully entered the meditative concentration on the varieties of phenomena called the Appearance of the Profound. At that very time as well, holy Avalokitsevara, the bodhisattva, the great being, beheld the practice itself of the profound perfection of wisdom, and he even saw the five aggregates as empty of inherent nature. 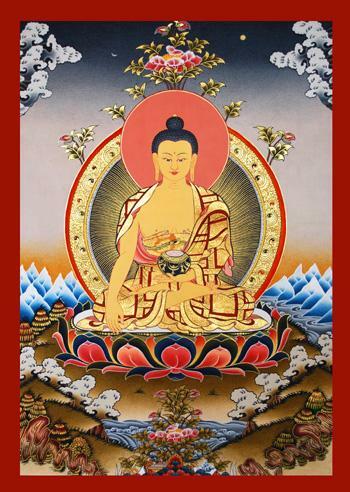 Thereupon, through the Buddha's inspiration, the venerable Sariputra spoke to holy Avalokitsevara, the bodhisattva, the great being, and said, "Any noble son who wishes to engage in the practice of the profound perfection of wisdom should train in what way?" When this had been said, holy Avalokitsevara, the bodhisattva, the great being, spoke to venerable Sariputra and said, "Sariputra, any noble sons or daughters who wish to practice the perfection of wisdom should see this way: they should see insightfully, correctly, and repeatedly that even the five aggregates are empty of inherent nature. Form is empty, emptiness is form, Emptiness is not other than form, form is also not other than emptiness. Likewise, sensation, discrimination, conditioning, and awareness are empty. In this way, Sariputra, all things are emptiness; they are without defining characteristics; they are not born, they do not cease, they are not defiled, they are not undefiled. They have no increase, they have no decrease. "Therefore, Sariputra, in emptiness there is no form, no sensation, no discrimination, no conditioning, and no awareness. There is no eye, no ear, no nose, no tongue, no body, no mind. There is no form, no sound, no smell, no taste, no texture, no phenomenon. There is no eye-element and so on up to no mind-element and also up to no element of mental awareness. There is no ignorance and no elimination of ignorance and so on up to no aging and death and no elimination of aging and death. Likewise, there is no suffering, origin, cessation, or path; there is no wisdom, no attainment, and even no non-attainment. "Therefore, Sariputra, since the bodhisattvas have no obtainments, they abide relying on the perfection of wisdom. Having no defilements in their minds, they have no fear, and passing completely beyond error, they reach nirvana. Likewise, all the Buddhas abiding in the three times clearly and completely awaken to unexcelled, authentic, and complete awakening in dependence upon the perfection of wisdom. tadyatha - gate gate paragate parasamgate bodhi svaha! Sariputra, a bodhisattva, a great being, should train in the profound perfection of wisdom in that way." Thereupon, the Blessed One arose for that meditative concentration, and he commended holy Avalokitsevara, the bodhisattva, the great being. "Excellent!" he said. "Excellent! Excellent! Noble child, it is just so. Noble child, it is just so. One should practice the profound perfection of wisdom in the manner that you have revealed - the Tathagatas rejoice!" This is what the Blessed One said. Thereupon, the venerable Sariputra, the holy Avalokitsevara, the bodhisattva, the great being, and that entire assembly along with the world of gods, humans, asuras, and gandharvas, all rejoiced and highly praised what the Blessed One had said.